The Perfect tense is a very important tense in German grammar. We use it almost always, when speaking about the past. On this page, I shall explain to you how to construct the Perfect tense and when to use it. I shall show you the whole thing first using the example sentence “Ich lerne Deutsch” (I learn German). “Auxiliary verb” (“Hilfsverb”) here means that at position 2 in the main clause (where the conjugated verb is ALWAYS found) there is a verb that helps us to construct the perfect tense in German grammar. The auxiliary verb does not have any meaning by itself, it has only a grammatical function. Because of this, there are fundamentally only two possible verbs that one can use as the auxiliary verb for constructing the Perfect Tense, namely the verb “haben” and the verb “sein”. Let me explain to you when to use “haben” and when to use “sein”. Present tense: I learn German/ I am learning German. The verb “lernen” becomes the past participle and moves from position 2 to the END of the sentence. To Position 2 now comes the auxiliary verb “haben” in conjugated form, so “Ich habE”, with an “e”. For you, it is important to note that the actual meaning of the sentence is not shown by the conjugated verb in Position 2 anymore but by the past participle at the end of the sentence. Only the auxiliary verb is ever found in Position 2; mostly we use the auxiliary verb “haben”, and with regular / weak verbs we only EVER use the auxiliary verb “haben”. When do we use the auxiliary verb “sein”? What are Verbs of Change of State? The verbs “sterben”, “einschlafen”, “verwelken” and obviously many more are thus so-called Verbs of Change of State and form the Perfect Tense with the auxiliary verb “sein”. So far so good. In my experience, however, German students now find it difficult to tell whether they are dealing with verbs of Movement or of Change of State. Furthermore, there are some verbs that you really can’t say whether they are Verbs of Movement or not, for example with the verb “spielen”. Most people associate that verb with movement, and in spite of this, when constructing the Perfect tense with this verb you use “haben”. In addition, there are often regional differences. In Austria, some verbs take a different Auxiliary Verb when constructing the Perfect Tense to Germany. So there is always lots for German Students to be confused by! 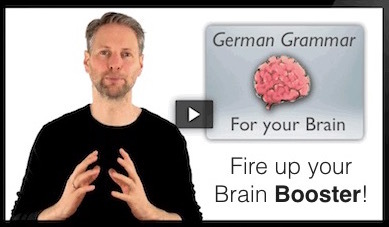 For this reason, I describe in my eBook “Learn German Grammar with Mnemonics” special learning techniques, that make it easier for you to tell which verbs in the Perfect tense use the auxiliary verb “sein”. When do you use the Perfect Tense? The statements made with both grammatical times/tenses mean exactly the same. The difference is only in the communicative context of the sentence. We have to distinguish between a formal, public, literary context and a more easy informal context. Generally the rule is that you use the Imperfect tense in a formal context, for example in literature written in a serious tone such as Newspapers, scientific work or in a serious public speech. If it is meant to be received in a more casual manner, we use the Perfect tense. When we email our friends, for example, or in normal everyday speech and so on. Now you also understand why the Perfect tense is so important in German grammar. If we are talking “ganz normal” in everyday life and we speak about the past, we use the Perfect tense. So it is very important that you can use it properly. Start memorizing grammar as easily as A, B, C!